Pacific Union real estate professionals involved with our Community Fund and company CEO Mark A. McLaughlin with San Francisco General Hospital staff members earlier this month. 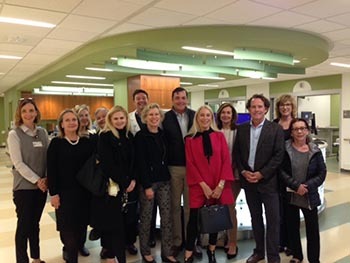 Earlier this month, members of the San Francisco Pacific Union Community Fund (SF PUCF) toured the soon-to-be opened Zuckerberg San Francisco General Hospital and Trauma Center, buoyed by a large donation from Facebook founder Mark Zuckerberg and his wife, Dr. Priscilla Chan. For several years the SF PUCF has been supporting the hospital’s annual Heroes & Hearts benefit. More than 20 years ago, our real estate professionals created Pacific Union’s community fund. Participating professionals donate money from their completed home sales to the PUCF, and the fund distributes it via grants to nonprofit organizations that serve Bay Area communities. Pacific Union real estate professional Susan Peterson has been involved as a PUCF committee member since its inception in San Francisco in 1993 and has served as its chairperson since 2001. The PUCF began in San Francisco but spread to other Pacific Union regional offices over the years. The Pacific Union corporate office also contributes to the fund. Our real estate professionals suggest organizations for consideration, and at the end of each year the regional committees meet to decide which charities will receive grants from the fund. The recipients often have a connection to shelter and housing causes. Over the years, the various PUCF funds have distributed grants to more than 100 local nonprofits. Some of the featured grantees from the SF PUCF include Curry Senior Center, Homeless Prenatal Program, Huckleberry Youth Program, La Casa de las Madres, Raphael House, and the San Francisco Child Abuse Prevention Center. Last year, the PUCF donated money to more than 15 organizations. Pacific Union has funded some organizations for years, and many of the grants sponsor annual events to benefit nonprofits. Pacific Union professionals regularly attend these benefits to represent our company and to learn more about the charities’ work in our local communities.